We all have one, a voice that expresses criticism or frustration, disapprove of our actions. It might sound like “what’s wrong with you”, “why can’t you get it together”, “that was stupid”, “they will find out you don’t know enough”. 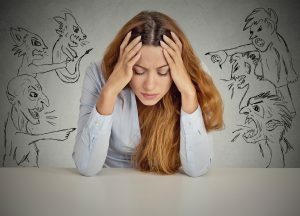 At best these negative thoughts are just present like background noise, and at worst they might paralyze you, prevent you from a successful career, a healthy relationship and may even lead to depression. The good news is: you have the power to change these negative thoughts. You were not born with these negative thoughts. Below are some ways to begin to disrupt them so that you can start building new, more positive messages. No matter how strong this voice seems, the act of noticing the voice begins the shift away from their impact on you. You cannot change what you are not aware of. One way to become aware is to just sit with your thoughts and watch them. Imagine the thoughts being like water in a river, just flowing by you. The goal here is to notice, not to catch the thought. In this step, just focus your awareness on the facts and messages of the voice. Don’t let your mind wander into the analysis of “why” you have this voice right now, and don’t allow yourself to argue with the voice. For now, just notice that you have a voice. “And exactly who is it that is trying to annihilate the ego?”. “Ooooh…I guess that would be my ego,” I had to admit sheepishly. In Shadow Work®, we believe there are 4 main energies that make up a human being, one of which is responsible for sustaining your ego. Scientists name these genetic pre-dispositions as Novelty-Seeking, Harm Avoidance, Dependence and Persistence. Everyone has some mix of these four genetic drives. And your particular mix plays a big part in determining your unique personality. Your genetic pre-disposition called Persistence has the special function of creating and maintaining your personal sense of self, your ego. Your ego is the mechanism that anchors all the other parts of you and gives you agency to act in the world. Without an ego, you can’t do much in the world. That’s why we like to say that “Ego is job one.” If your ego is well built you can be an effective agent of power, love, wisdom and service in the world. So if you are looking for someone who can perform well under pressure, get someone with a big ego. That’s why you want an airline pilot with a big ego. That’s why you want a brain surgeon with a big ego. Ego is needed to get things done. An unhealthy ego, on the other hand, leads to a shaky performance. That’s why as Moonbeam I had trouble making money. That’s why you wouldn’t want Moonbeam flying your plane. A weak ego will cause you to belittle others, in order to temporarily boost your cardboard identity. Or, in the other extreme, the weak ego with cause you to become a meek, indecisive wallflower who is afraid to take up space by speaking or acting with power. Both of these weak egos are like a container with cracks and holes through which the energy to get things done simply leaks out onto the ground. Here’s one of my favorite metaphors to illustrate the value of building a healthy ego. Your ego is a lot like the earth, orbiting around the sun. The earth has its own momentum which wants to break out of its orbit and follow its own straight path into the universe, never to return. You get caught up in this perilous momentum when you feel separate from Spirit (or your Higher Self, or the Divine, or Source or whatever you want to call it). When you are like a planet trying to speed off into infinity, you can, indeed, find some help in the teachings that recommend a dissolution of the ego. Getting outside your own ego can offer some incredible life-altering gems. Shifting your focus off yourself and towards something higher is an important step. But you can overdo it. Consider for a moment what would happen to the earth if it lost all of its own individual momentum. Suppose the earth abandoned its own trajectory and surrendered completely to the pull of the sun. The earth would fall into the sun. It would absorbed completely by the sun. And while the sun might become incrementally bigger, all the millions of species of life on earth would perish. In a solar system where the sun is powerfully pulling everything in towards itself, the opposing force of the earth’s individual momentum is the only thing protecting life on earth. Even though the sun and the earth are essentially one, (all matter is made of molecules that came from stars like the sun) there are millions of reasons to retain a sense of distinctness. This distinctness allows us to experience a unique essence. Like the earth in this story, our ego sometimes has a desire to go off on its own, in the opposite direction of Spirit. But if our individual momentum can be balanced with the pulling force of Spirit, the self can orbit around Spirit in much the same way as the earth orbits around the sun. This balance is the most fertile and productive formula yet to be discovered by science. The human species alone has almost 8 billion unique expressions of Spirit, no two alike, but all manifestations of the same essence. Each individual ego is a container capable of shaping Spirit into a never-before-seen art form. Many mythologies present this miracle as the reason life was created, so that the one consciousness could experience its own depth and breadth through a full range of manifestations. Cliff Barry is a Shadow Work Founder, Certified Coach, Facilitator, Trainer and Mentor. Heidi Loeppky is the founder of Shamaya Tantra and is currently training as a Shadow Work® facilitator. She is the co-creator of the Canadian Tantra Festival and offers regular Tantra workshops in her home base of Edmonton, Alberta. Her websites are ShamayaTantra.com and CanadaTantra.com. This article originally appeared in our free email newsletter in February 2019. To subscribe, visit our subscription page. Back to the Articles Index. “Shadow” can be a difficult concept to understand. Shadow Work facilitators and coaches often describe shadow as the parts of the self that have been disowned, denied or repressed. There have traditionally been two approaches in self-help books: what in Shadow Work® we call the “uphill” and “downhill” approaches. The uphill approach judges success by an external standard. It tells the reader, “Follow these rules that I offer, and you will succeed.” Success is a golden ideal written, as it were, in the sky. In order to reach the ideal, you, the reader, must ignore the resistance that rises inside you. If that becomes difficult, the uphill approach urges, “Just push through! Just don’t think about that! Just use will-power!” What keeps you going through the inevitable trials is your dream of doing it perfectly. The downhill approach, on the other hand, judges success by an internal standard. It tells you, “Look within for your true self, and learn to live it.” Success consists in becoming self-aware. In order to succeed, you must sometimes ignore what others think as you put your own truth first. If that becomes difficult, the downhill approach urges, “Listen to yourself, and follow your own path, wherever it may lead.” What keeps you going through the inevitable trials is your belief in fulfilling your mission to grow, however imperfectly. Neither approach is better. In fact, a mature growth process is a cycle that incorporates both approaches, beginning with an uphill phase. Since I’m in the process of writing a self-help book (about Shadow Work®, as a matter of fact), I’ll use that as an example. To publish a book, a writer must aim for the standard of what qualifies as a publishable book. The writer must get words on paper and structure the book in a way that appeals to publishers and readers. The writer must be motivated by a belief that the book’s concept can be realized in an ideal form. The writer must resist fear, impreciseness, avoidance, and other impediments to writing. When the writer becomes aware of the manuscript’s inevitable imperfections, there is an opportunity to shift to the downhill phase. With that shift to downhill, the writer views those imperfections with understanding and compassion, recognizing that they make perfect sense given the writer’s talents and perspective. The writer searches within his or her own heart to discover where the real passion lies. A new perspective emerges that reveals how better to capture that passion on paper. The writer views the first draft as a necessary learning experience, not as a mistake or a waste of time, because only by writing that first draft could the writer have reached the new perspective. The writer now has a new goal, and the cycle begins again. What happens more often, however, is that the writer concludes that there was a right and a wrong way to do it, and this time it was done wrong. Thinking that there is a right and a wrong way is characteristic of the uphill phase. The writer decides that if the rules had only been followed better, the manuscript would have been a success — a decision that reflects the uphill phase instead of a shift to the downhill phase. Many writers remain stuck in the uphill phase of the process, trying again and again for the same goal and believing there’s something wrong with themselves for failing, rather than accepting a truth about themselves and then basing a new manuscript on that truth. This difference between uphill and downhill approaches also says a lot about the differences between Jungian psychology and mainstream culture. Jungian psychology is based on a fundamentally different cosmology. Uphill cosmology, as held by mainstream culture, believes that human beings are subject to good and evil influences that struggle to dominate our will and actions. Good influences include God, Scripture, angels, good spirits, and so on. Evil influences include the temptations of Satan, the Devil, evil spirits, etc. Based on uphill cosmology, the task of human beings in this life is to block out the evil influences and allow only the good influences, so that our actions will be good. Downhill cosmology, as held by Jungian psychology (as well as by some Native cultures), believes that human beings are alive because the Creator has given us the life energy. Life energy is not inherently good or evil, it simply is. How we use that energy determines whether our actions will be good or evil. This in turn depends on our psychological health, or wholeness. When I act out of my wholeness, that is, acting consciously from what I like to call “my best self,” my actions will tend to be good. When I act out of my shadow, that is, acting unconsciously from my woundedness, my actions will tend to be evil. According to downhill cosmology, then, my task in this life is to heal the wounds inside me, so that I am acting out of my best self as much of the time as possible, and acting out of my shadow or woundedness as little of the time as possible. My favorite image for illustrating how we use our life energy to act in the world is the image of a flame burning inside a lamp. The flame is what makes us alive and akin to every other being with a flame inside. The flame remains pure and perfect regardless of what happens to us during our lives. The flame shines out through the glass of the lamp. That glass can and does take a beating as we go through life. The glass can be smudged, smeared, scratched, chipped, cracked, even shattered, by life events. If you’ve ever looked at a flame through a cracked piece of glass, you will see that the crack appears dark. In the same way, the perfection of our inner flame may look like darkness to the world when our actions reflect the crack and not the flame itself. Healing work like Shadow Work® can clean the glass, polish it, patch it, even melt it down and recast it, so that the flame can shine out in a way that reveals its Divinely-given beauty. Alyce Barry is a Certified Shadow Work® Group Facilitator and Coach, and a writer, in Evanston, Illinois, a suburb of Chicago. This article originally appeared in our free email newsletter in September 2006. To subscribe, visit our subscription page. I’m often asked if Shadow Work coaching is similar to life coaching.